The T6 is fast becoming the customers favourite. 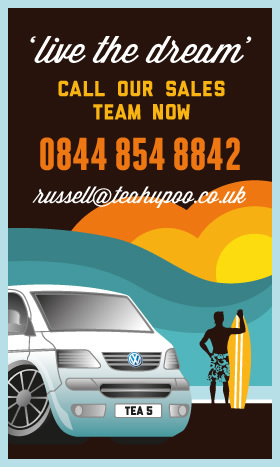 Call Teahupoo VW for the cheapest quote in the country. We challenge you to find a van centre that will sell you a cheaper T6. Also we have access to a massive range of used/new T5 Highlines, 102bhp and 140bhp, these are still the cheapest in the country. Our sourced vans just get better and better, in quality and price. Teahupoo have been sourcing some of the best vans in the country. Not only are they all in top condition but they are all very low mileage. Our traders work closely with us to ensure that every van we receive for conversion is in tip-top condition, knowing exactly what we want to supply to our customers. Traders from as far away as Edinburgh, London, Dartmouth and Devon reguarly call Teahupoo, usually VW Van Centres and sister companie. All this coupled with our solid units, our own Teahupoo Roof, single front seats and beds, we really ask anyone to better Teahupoo for price. Customers ring up and ask, “do we need to source our own van”, no, we do all the hard work, you just pick your specification of van. “Can you find us a VW T5 T6 transporter”? Yes we can, Whether it be a low mileage standard transporter, a mid-range transporter, maybe with air-conditioning and electric windows. Or a top-of-the-range VW Kombi, Shuttle, or Sportline, we will find it. Colour does make a difference to the price bracket, as does air-conditioning and tailgates. However this doesn’t mean it is impossible. Again, give us a ring to discuss the options available. Remember it’s your drive, your mobile home and your money. We are here to help you. We are here to put together a campervan which caters for you. The testimonials speak for themselves, whether it’s a proud owner of an ’08 plate, or a shiny new ’67 plate, they have all been picked by the customer. We will not buy a van until we have spoken with you, once a van has been sourced, we will advise you whether the van should be purchased. Give it a try, it’s fun. We can be relied upon to deliver. Please contact us to find out more about sourcing your ideal campervan.